Porto Club Vacations: TASTEFUL CRETE!!!! Tasteful Crete Discover the fresh, pure olive oil, garlic, fresh herbs, wines, breads, and fresh pick up vegetables. We want to emulate a lifestyle where food, wine, and family meals are very important things and where time and care go into preparing food and eating. When you return from your travels, what do you recall? The sights, sounds, smells, taste. Travellers and adventurers realize that the cuisine of a culture is often one of its most revealing treasures. We designed this tour so that our guests can immerse themselves more fully in the culture of Crete and the treasure of its food. For centuries Cretans apprenticed the ART of hospitality. They have now become Masters of this ART. Be prepared for a strong sense of daily life and for truly warm hospitality. Know the mysteries of a wonderful and hospitable land. Cretans are the hosts; you are the guest of honour! Feel the meaning of family, relations so strong, so real! At village Tzanakiana / Margarites around 25 km southern east the city of Rethymnon. A fine stone-built country manor of 1750, the Kouriton house classified as historical. It has been preserved for its traditional architectural structure, typical of the Cretan design stemming from prehistoric Minoan mansions. Run by the owner retired University professor of Music a very nice and warm lady and her sons. Price includes breakfasts and dinners at the manor prepared by the house lady with fresh ingredients from the area but most important with love and care. During the days we do cultural drives visiting small villages / spend time with locals / wine tasting / food wandering/ archaeological – historical sites / monuments having lunch on spots. Following this option, we visit central and eastern regions. During the restoration procedure, the historical listed monuments “Kouriton House” preserved all the architectural characteristics of the 18th century house that has its roots at the pre-historic Minoan mansion: the backyard with the rock-built ponds and the terraces, the oven-house, the ceramic chimneys, the bedrooms, the rest for pitchers, the old jars, the crenellation and the rock-hewn surface water reservoir. The house has 7 bedrooms that can accommodate from 2 to 4 persons. On the ground floor there are 2 two-bedroom flats with a fireplace, an oven-house as well as a dining room with very old jars and a monastery-style table, where the guests can enjoy thematic breakfasts based on local products and traditional recipes. On the first floor of the house there is the living room, where the guest can have a drink or use the internet. Every piece of furniture is a copy of the original Cretan furniture of the house, while the beds are authentic antiques. Every room has a fridge, a TV, a hair dryer and ecological air conditioning. The guest house also provides drinking water from the fountain located in the area as well as a softener. It is built right at the entrance of the forest and the historic paths with a view over the evergreen gorges and the traditional settlements. The guest house has a rich library with vast folklore – historic material, leaflets regarding the Cretan gastronomy, a photocopy machine and audiovisual material infrastructure. Upon arrival at the airport of Heraklion you will be met by George your personal English speaking driver and host with welcome refreshment. Within minutes you realize that you have been transported to another time – you need only relax and soak in the experience. You will be treated to Greek coffee and a Cretan traditional Mediterranean meal with a variety of dishes, and then later driven west to the Lodge. It is a 70 minute drive, and if you have arrived mid-day, you will also enjoy home-made Cretan food. You can even join in the meal preparation if you wish, or just relax and have it all done for you. The flavours and freshness of the picture perfect variety of foods are a wonderful welcome to the Island of Crete. After a full breakfast buffet consisting of fresh pastry, fruits, vegetables, meats, eggs and cheese, you will depart with George who is knowledgeable of Crete, her history and allure. The town market of Chania dating back to the 1900’s is a cross-shaped gallery that houses over 65 food stores, presenting fresh fruits, vegetables, meat, dairy products, breads, legumes and anything else you may want such as cafés, restaurants and shopping. Lunch will be in Spaltzia (Turkish quarter during the Turkish occupation) at an old harbour restaurant featuring a variety of local specialties. On the way back to the lodge, there is a stop to buy fresh seafood for the evening cooking class, and also a stop to buy the famous bread of Georgioupolis made in the same method for the last 150 years with its unique smoked taste. The evening will feature your first hands-on cooking class based on the fish and seafood that was purchased earlier in the day. Fish soup with rice in egg and lemon, the famous KAKAVIA (fisherman fish soup), fish with tomato and onion sauce baked in the oven, fresh fish grilled and fried are a few of the cooking menu items. A basic feature of the Cretan diet is the large consumption of vegetables. On average Cretans are at the top of the scale in terms of vegetable consumption. In fact, they consume three times the amount of vegetables than Europeans! That too is a part of their secret for a long and healthy life. A delicious dinner will be enjoyed that your own hands helped prepare. Lots of pure homemade local wine is served with dinner meals. After breakfast at the Kouriton House where you will be staying, take a drive through the vineyards and small villages of the Rethymnon region. Visit the 16th century monastery of Arkadi. 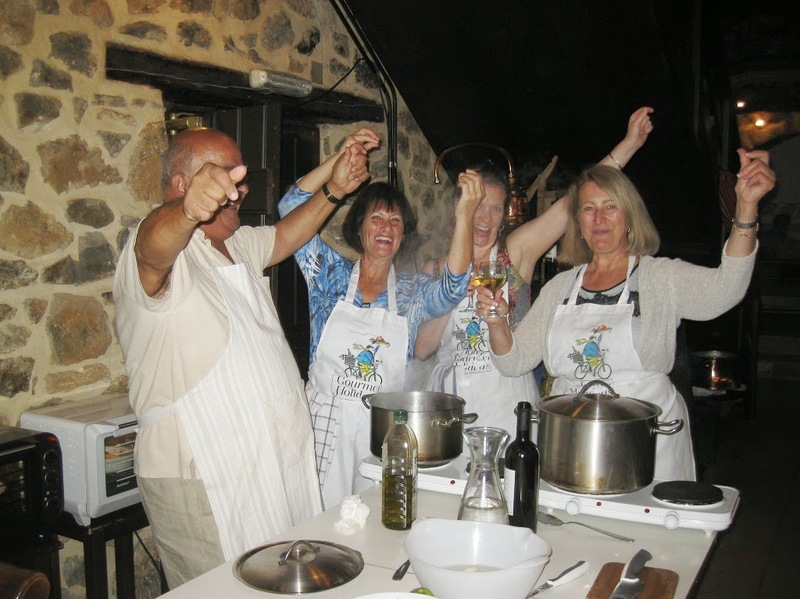 After the class you’ll enjoy the fruits of your labour with the group along with some raki and local wine. You now find yourself in the heart of the Cretan kitchen. Cretans feel the urge to share their secrets of life with the world. Besides their history and culture, you will share their prized heritage known as the Cretan Diet. Local producers warrant that all Cretan products are pure, without chemical substances or other preservatives and additives. These products, being a part of century old tradition, are treated with the same respect as that afforded to them by their ancestors. Tonight’s hands-on class is based on a variety of vegetables and minced meat with prep techniques that transforms basic ingredients into a full table of colour, variety and richness. Moussaka, Aubergines Papoutsakia, fried vegetables in tomato sauce, smoked eggplant and Pastitsio, with vegan and vegetarian options will be in abundance. As always, local wine will compliment your meal and enhance your evening. Enjoy a leisurely breakfast before heading out to explore the south-central part of the island with your host George. Today you’ll visit Gortys, the ruined capital city of the Roman province which included the island of Crete. Phaestos is an ancient palace and you’ll also see the site of the ancient city is was located in offering a detailed insight into ancient life. Stop off in the fishing village of Kokkinos Pyrgos for lunch and enjoy local specialities or freshly caught seafood. After lunch you’ll head back to the Kouriton and head to the kitchen for your first cooking class. This evening’s hands-on class focuses on local meats and casseroles and George will teach you preparation techniques that transform basic ingredients into the stars of the table, full of richness colour and flavour. After the class sit down and enjoy the meal you’ve learned to cook accompanied by local wine. Preparation is the key to the variety of dishes that will be created. Time spent in slicing, dicing, chopping and pealing enables the assembly of various dishes in record time. Pork bites in tomato sauce, and Drunken Pork bites cooked in wine and oregano are wonderful appetizers paired with Raki (an alcoholic drink that is made from the grape peel, after the wine has been produced). Boneless pork with celery and egg and lemon sauce, Oven baked Lamb with potatoes , Free-range lamb tsigariasto and lamb fricassee are also on the menu. Dinner will be accompanied with copious amounts of pure, homemade local wines. Viniculture is a 4000 year old practice on the island of Crete. After your buffet breakfast your tour will start in the direction of Heraklion driving the side roads to Heraklion. First break you visit one almost forgotten monastery, and a church with beautiful frescoes. Keep driving to the village of Marathos where we visit the women cooperative work shop at the village of Marathos where they make the very special (unique art pastry small and bigger round breads), we call them “Xompliasto Koulouri” and big variety traditional hand made cookies and sweets. Next stop the little café of Doxa. The place is 20 km far from the city of Heraklion and 50 km from our accommodation; Beautiful untouched nature is perfect pasture for bees. Old traditional bee-keeping methods ensure ecological, clean and free from any additives honey and other bee products. First honey of the season is collected from spring thyme blossoms. This golden yellow honey is perfect source of nature’s ingredients. We do a break at this small local café / restaurant run by the bee-keepers since 1949. The owners (two brothers) have been beekeepers since all their lifetime taking the business from their father. Therefore, we taste honeycombs straight from the beehive and learn everything about bees and beekeeping as well as having a kind of pancakes we call them “tiganites”, deep in honey and small cheese pies with honey in company with local wine and the Cretan snap, Raki. You will definitely feel the positive effect to your body and soul. It is believed that the secret for a long and healthy life lies in olive oil, the principle ingredient in the Cretan diet. Past and present research conducted in the US and Europe supports the view that olive oil not only shields the human heart from disease, but also increases healthy operation of other organs by reducing cholesterol. Olive oil is an important ingredient in all dishes on the dinner menu. This hands-on class will take you through the process of making stuffed tomatoes, peppers, courgettes, and aubergines…as well as Dolmadakia (little stuffed wraps) with vine leaves, sorrels or pumpkin flowers. These all can be enjoyed as a meze or main course. At the conclusion of your Cretan holiday, you will be armed with a full assortment of Greek recipes that are easy to reproduce back home. Friends and family will be so impressed! After breakfast, today’s excursion takes you to Knossos, an ancient palace and must-see archaeological site of Crete. After visiting the 3500 year old site of Knossos, you’ll head to Heraklion and take a walk through the city taking a gastronomic tour of all the best local food places and vendors. You’ll visit the best pastry shop in the city and sample filo pastries in syrups, with cheeses before heading to a coffee shop and tasting coffee roasted the traditional way in hot sand. Next you’ll explore the central market and stop for an ouzo with meze at one of the traditional Mezedopolion (restaurants). You’ll also have the opportunity to see the cathedral of Saint Minas, the Morozini fountain, Venetian church turned art gallery before heading towards the seaside. A light lunch will be served accompanied by chilled white wine before ending your gastronomic walking tour to taste the famous loukoumades, Cretan style doughnuts sprinkled with honey and sesame. After the walking tour, you’ll head back to the Kouriton House to relax before a farewell dinner which tonight is your day off from cooking and a chance to enjoy a meal cooked by the lady of the house. Dinner is a chance to sample yet more local dishes and compare them to the dishes you’ve learnt during the week and discuss the sites, tastes and sounds of your holiday with new friends over wine and raki. Tonight your dinner will be prepared by the lady of the house. You will have the opportunity to sample a large variety of specialties (called mezedes) accompanied by the Cretan Snap RAKI! Are you tempted to compare her dishes to those you have learned during the week? You have made wonderful new friends and explored a new region of the world filled with some of the best food you have ever tasted – what more could one ask? After a restful sleep, transportation will be provided for you to meet your departing flight. After a leisurely breakfast guests are asked to check-out of their rooms and be ready to be taken back to the airport taking home with them an insight into Cretan life, new friendships and unique culinary and cultural memories that will stay with them long after the holiday is over.